THE LATEST Acusera tumour marker control from Randox covers 15 of the most common cancer antigens and tumour markers, and includes assayed, instrument-specific target values to enable laboratories to monitor accuracy and precision. Supplied in ready-to-use liquid format makes this control fast and convenient in the laboratory, eliminating the need for reconstitution and reducing the manual handling requirements. The material can be shipped and stored at temperatures between +2 and +8C. Supplied in packs of six 3ml vials, the control remains stable once opened for up to 30 days to help minimise wastage and running costs. Like all Randox immunoassay controls, the serum is 100% human in origin to provide a matrix similar to patient samples. This feature also reduces antibody cross reactivity and the chances of control values shifting when the reagent batch is changed. 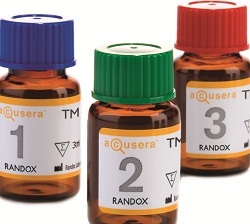 Laboratories can use the Acusera liquid as a true third party marker control to independently assess analytical performance. Fully assayed, instrument specific target values and ranges are provided for many common clinical chemistry and immunoassay systems. Acusera liquid tumour marker control includes AFP (Alpha-fetoprotein), Beta-2- Microglobulin, CA15-3, CA19-9, CA27-29, CA72-4, CA125, CEA (Carcinoembryonic Antigen), Cyfra 21-1, Ferritin, hCG (Human Chorionic Gonadotropin), NSE (Neuron-specific Enolase), PSA Free (Prostate Specific Antigen Free), PSA Total (Prostate Specific Antigen Total) and Thyroglobulin.